THE DEE ESTUARY, mile after mile of creeks and sandbanks, boasts one of the best dab fisheries in the UK at Talacre and in season is well known for its cod, whiting and bass. You could be forgiven, however, for not adding conger eels to the list. Read on and be amazed! I have lived and fished on the estuary all my life and can recall several large eels being washed up alive over the years. They were probably at the end of their natural lifespan, and I can vividly recall the commotion one particularly large specimen caused in the early 1970s. I was working as a chemist in the steelworks labs and downed tools with the rest to climb the embankment and stare at the goliath stranded by the ebbing tide. It was officially weighed at 91lb. 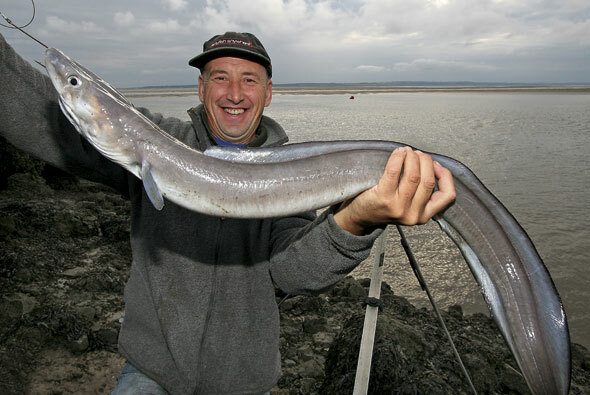 Where on earth does a conger of this calibre come from in what is essentially a sandy estuary? The answer goes back to its industrial past. From about 1800 to the early 1960s a busy ironworks stood on the current Mostyn dock site, and I fondly remember the huge orange-red glow in the night sky when the furnaces were tapped. WHAT has this to do with fishing? Quite simply, when iron is smelted in a blast furnace vast quantities of slag (limestone and spent iron ore) are also produced and this waste product became the building blocks of a home for conger eels. Visitors to Mostyn today will see that the entire dock is built on furnace slag tipped along the riverbank and at one point out into the river itself to form what is locally known as 'the tipping end'. Over one and half centuries that added up to a lot of rock and resulted in today's almost sheer slag and clinker banks jutting out into the estuary. In general the water is shallow, but at Mostyn the scouring action of the strong ebb and flood tides has resulted in a deep channel right under your feet - literally a 20-yard lob. The honeycomb of mussel and barnacle-encrusted rocks supports a rich fauna. Shrimps, prawns, shore crabs and edibles abound, while a myriad small fish come and go on the tides. Conger country! THESE days, with the ironworks long gone, the port is known for shipping Airbus 380 wings to France. This means that the channel has to be periodically dredged to keep it open - more good news. Sadly, the tipping end is within the port perimeter and inaccessible to the angler, but the riverbank to the east offers some fine conger fishing. If you want to give it a go, the first requirement is a pair of heavy soled boots, because standing on the rocks for any length of time plays hell with the feet and legs. 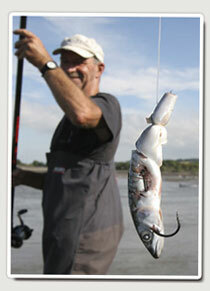 Arrive at half ebb, preferably on a medium tide (28ft Liverpool) and aim to fish two hours either side of low water. It is essential that you bring the proper beefedup gear - 0.35mm mono and wishy-washy rods just won't get the eels up. Peter Corker and I took cameraman Mike Dobson for a session last summer. We both took heavy 6-8oz beachcasters about 12ft long, which helps with the retrieve angle as long as you get yourself nicely set up close to the water. Reels must be man enough, so I used Penn 535s loaded with 40lb mono, while Peter chose 50lb braid. We both used a rubbing leader of about 80lb, to prevent the line being sheared by the barnacles encrusting the wall. 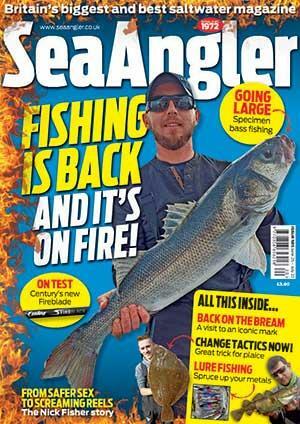 End tackle for this style of fishing is uncomplicated - a 2-4ft paternoster fixed no more than 12in above the lead. Plain leads attached with weaker line are preferable to spikes, the use of which usually ends in tears. Peter favoured a short length of wire to the hook while I used 150lb commercial nylon. Hooks were size 6/0 to 8/0 O'Shaughnessy or, in my case, Varivas Big Mouth Extras. We used frozen joey mackerel, working the hook through the bait so that the point was at the head end and tying off the tail with a little elastic. There was no need for us to cast more than 20yd - any further and your bait ends up in shallower water, away from the foot of the wall where the eels live. BITES usually come very quickly, and it is important that you get yourself fixed up beforehand with a good firm standing platform. People don't understand what they are up against with a conger and underestimate their sheer brute strength. The trick is to pick up the rod at the first twitch and, taking a firm stance, set the hook on the first drag down...if you wait for the second pull the eel will have its tail back in a crevice and you'll never get it out. Pump and wind like crazy and if you don't get a hernia you're not doing it right.